Los Angeles Sues Justice Department, Joining Other 'Sanctuary Cities' LA is among the jurisdictions that limit their cooperation with federal authorities on immigration enforcement. The Trump administration has threatened to cut millions in funding to them. Attorney General Jeff Sessions speaks at the Department of Justice on Aug. 4. The department is being sued by multiple cities, including now Los Angeles, over its stance on "sanctuary cities." The lawsuit seeks to join similar legal challenges that the state of California and the city of San Francisco lodged earlier this month against the department over new conditions it has imposed on federal grants for local law enforcement. The city of Chicago is also suing the department over the matter in a separate suit. The legal claims all accuse the Trump administration of threatening to withhold funding to try to force local jurisdictions to enforce federal immigration laws. "We're suing to block the Trump Administration from unconstitutionally imposing its will on our city," Los Angeles City Attorney Mike Feuer said in a statement. "The administration would put L.A. to the untenable choice of risking a key public safety grant or making LAPD an arm of federal civil immigration policy." 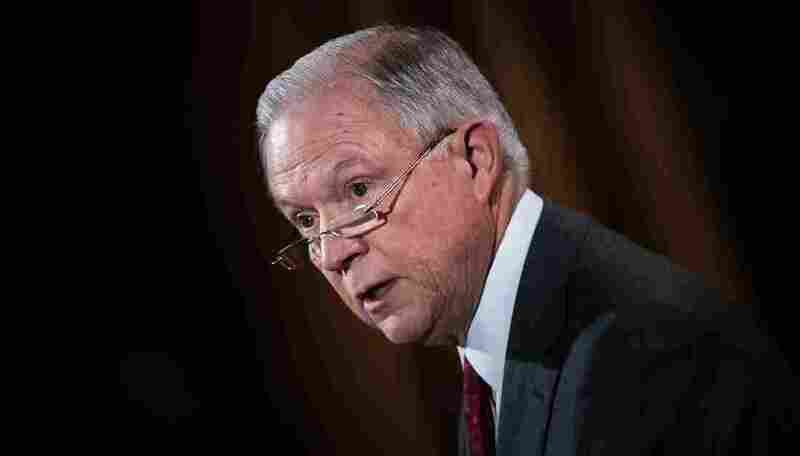 Attorney General Jeff Sessions says sanctuary policies fuel crime and make communities less safe. His push against such communities is part of the Trump administration's broader effort to crack down on immigration, both legal and illegal. "Since 2014, violent crime has risen in Los Angeles. That's why it is so baffling that the city would challenge policies designed to keep residents of L.A. safer, especially from the scourge of transnational gang activity from MS-13, 18th Street Gang and others," Justice Department spokesman Devin O'Malley said Tuesday in response to the city's lawsuit. "Reversing sanctuary city policies is about more than just enforcing federal immigration law by detaining criminals here illegally — it's about re-establishing a culture of law and order, where crimes are punished and people are deterred from committing them." The sticking point over the local law enforcement grants centers on two new conditions the Justice Department has placed on the program: It wants jurisdictions to give federal immigration authorities access to their jails and to provide at least 48 hours' notice before releasing an undocumented immigrant in custody. Some localities refuse to do so. They say they have policies in place that prohibit them from handing over immigrants to federal immigration officials without a warrant from a judge. They also say the DOJ's new conditions would make members of immigrant communities less willing to come forward and cooperate with local law enforcement for fear of being deported. Local officials use the grants for a range of things, from hiring more police officers to buying new police cars, computers and even bulletproof vests. Some communities use the money to fund public safety programs to help, for example, at-risk youth or to combat drug use. In its lawsuit, Chicago says the grant money has provided "critical (and, at times, lifesaving) equipment" to the city's police and critical services to residents. This is the second time that cities and states have used the courts to challenge a Trump administration threat to yank funding for sanctuary cities. In April, a federal judge temporarily blocked an earlier attempt by the administration to withhold funding for them.